What activities are planned on handbell cruises? During the days that we are “at sea” (two or more days) there will be ringing activities, including massed ringing with our guest clinician and classes. We usually have time to help people with bass techniques, treble techniques, special techniques, solo and ensemble ringing or other topics cruisers find interesting. When bell activities are not scheduled, the bells are available for rehearsing, practicing ensembles (formed by those interested on the first day), and more. There will also be a sail-away cocktail party on the first night. Otherwise, you have the opportunity to enjoy the cruise and the ports into which we sail! Are there concerts for the ship’s passengers? Yes, handbell cruisers will perform the pieces they have learned. The showcase is open to the ship’s passengers, but space is usually limited. Bells of the Cascades will also play a concert at some point during the week that is open to all. What should I bring? Do I need to bring bells or music? People coming on the cruise with us do not need to bring their handbells. We supply all of the bells, music — no need to prepare in advance! — and other equipment. The only things you need to bring are yourself, your luggage, and an easel (split-back) binder, gloves and a riser (if you want one). Because all the equipment is borrowed, even if you’re used to ringing without gloves, we ask that you wear them on the cruise. They can be any color and style, black, white, tie-dyed, gardening, etc. How many people usually go on the bell cruise? Our normal attendance is between 125 and 150. About two-thirds of those people participate in the ringing activities. There are, of course, many other people on the cruise ship. Can non-ringing friends and family go too? We even have a beginners class designed for those who have come with friends and never rung, but want to try their hand at it in a very low-key environment! Prices are based on double occupancy. When booking, ask your agent about special pricing for third and fourth passengers in a cabin and any promotions that can be applied to add amenities to your cruise. Prices include all port fees, taxes, bell activities, and food and ship entertainment while on board. View details about cabin options on Cruise XV. Where have you gone in the past? 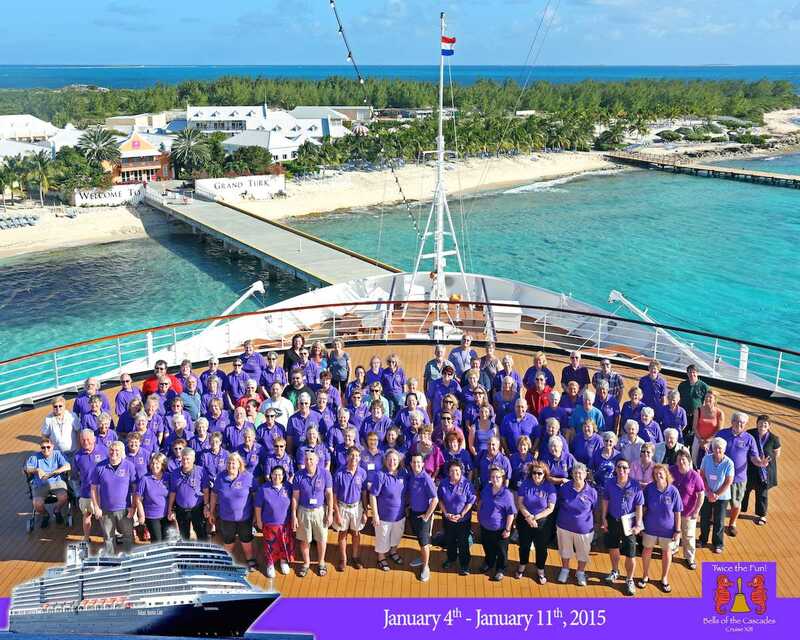 View images from these handbell cruises. Head over to our handbell cruise page to learn more about book your ticket!